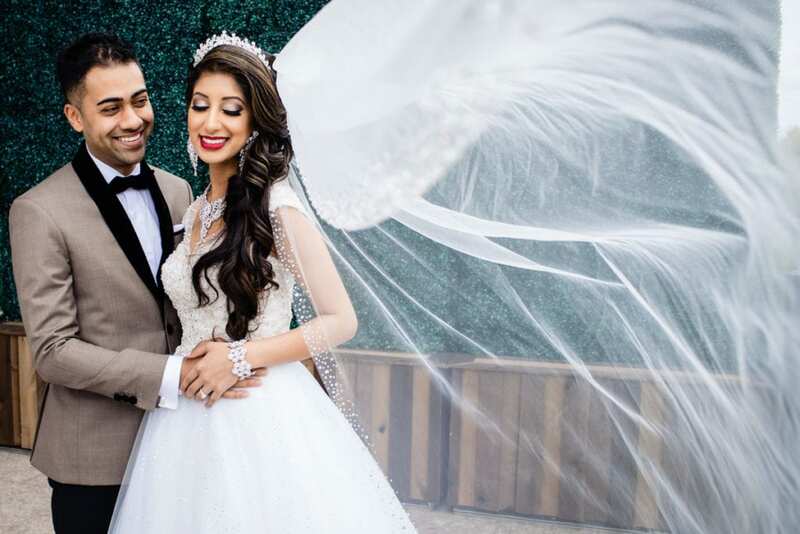 Here is a blog post we think would be most useful for our brides in Toronto, Vancouver and all major cities across North America as well as for the brides in Mexico or Dominican. 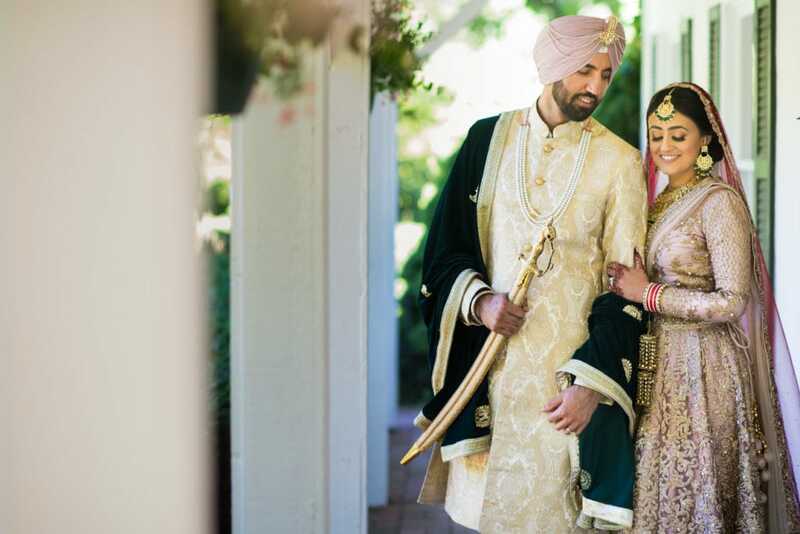 North American Sikh or Hindu Weddings tend to have different schedules than Sikh or Hindu weddings in India, England and the rest of Europe; schedules do vary for North American Sikh or Hindu weddings. 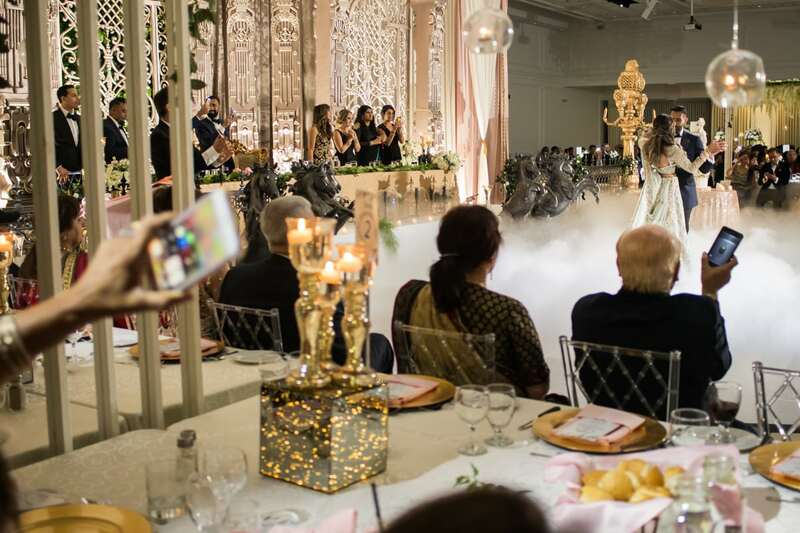 These timelines are based on our photography experience and may differ from your wedding planner’s experience. 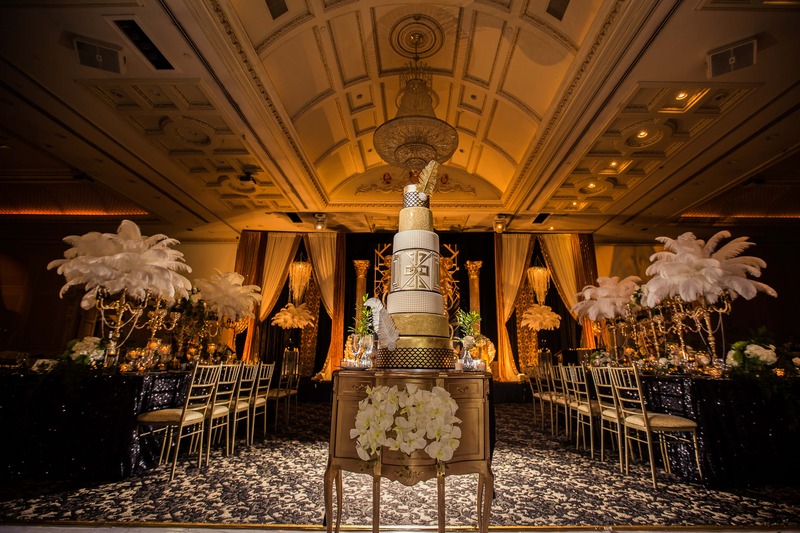 The first question you need to ask is what time would you like to be at the ceremony venue. 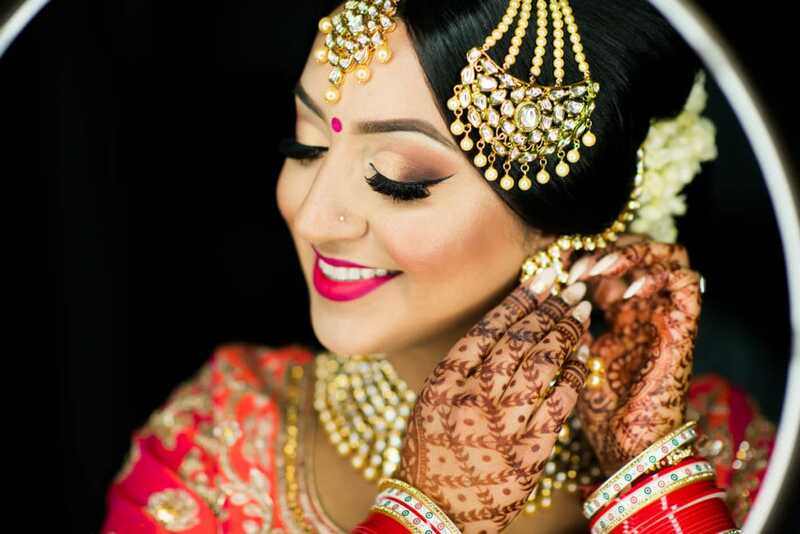 For Sikh and Hindu Bride, we plan for an hour to an hour and a half for the getting ready photos. 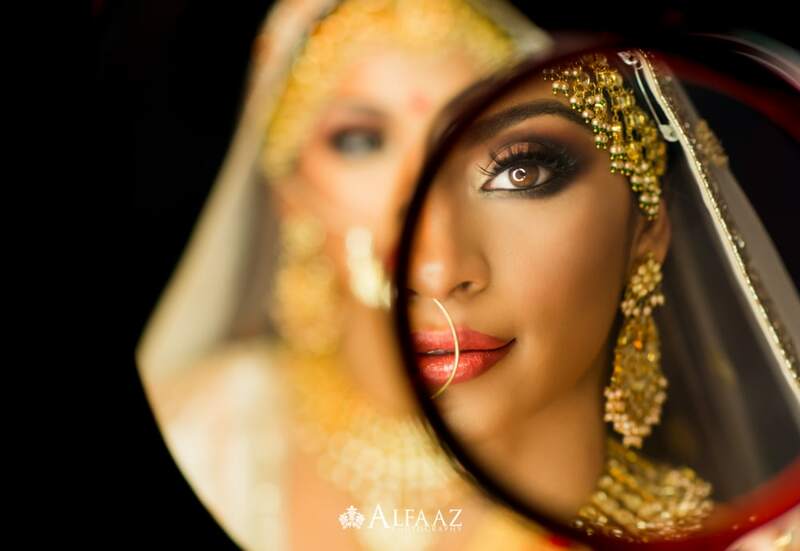 Depending on how far you are located from the ceremony venue, you should plan to be fully ready 2 hours before you want to be at the ceremony location. 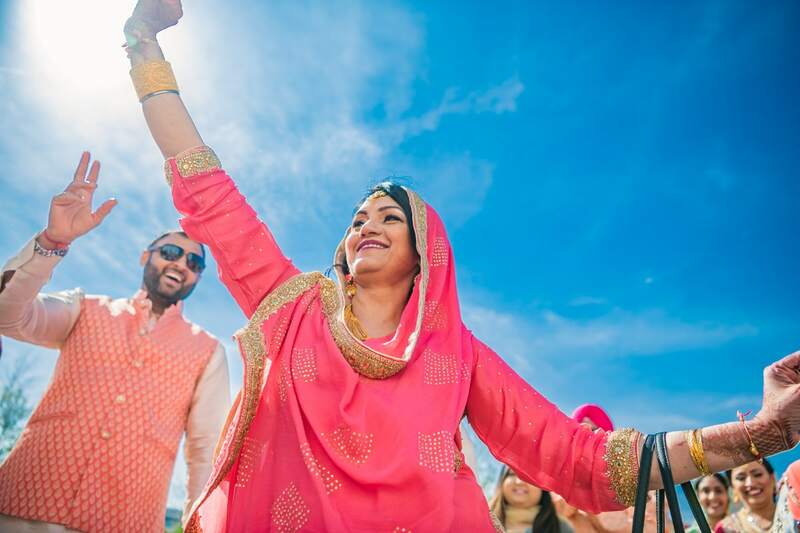 In Sikh or Hindu morning wedding ceremonies, the Baraat is usually scheduled to arrive around 9 am. 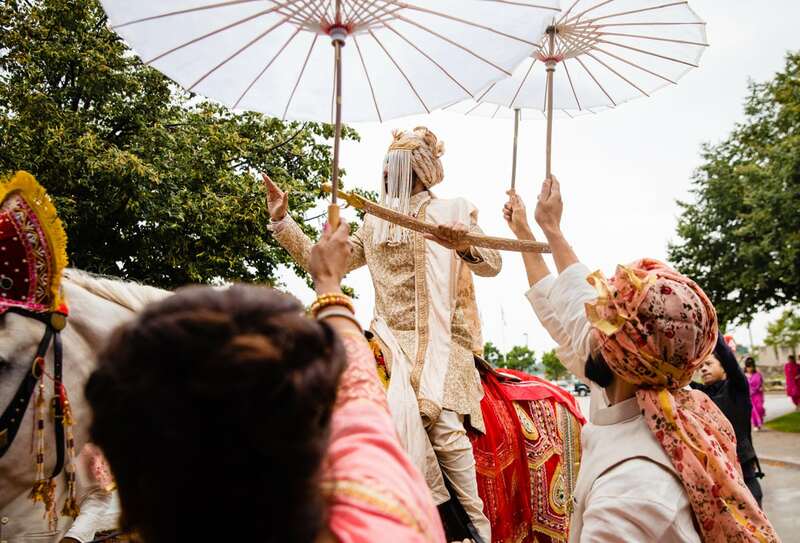 If you are planning to begin your ceremony around 10 or 10:30 am, the Baraat should be at the venue by 8:45am. 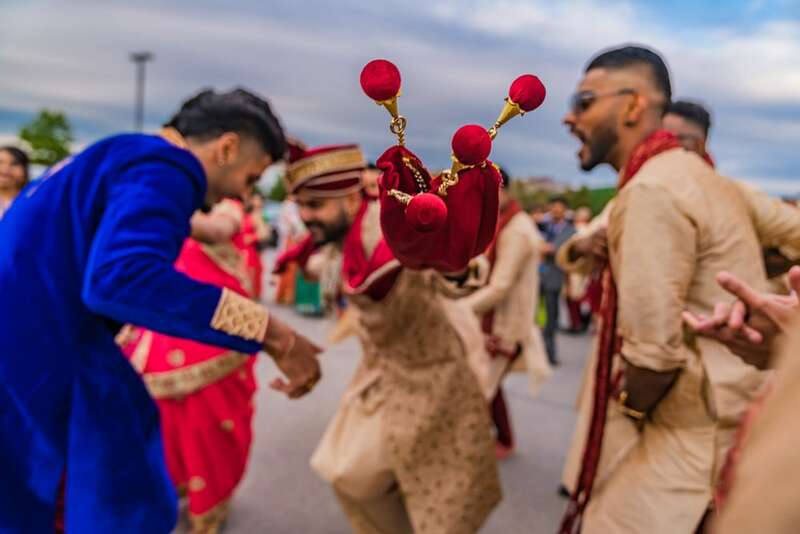 Note that sometimes Hindu wedding ceremonies are held in the evening, then we can expect the Baraat to arrive in the afternoon.On average, the Baraat takes about 30-45 mins, which includes assembling everyone and getting the Baraat going. If there is a horse included in the Baraat, add another 15 mins. 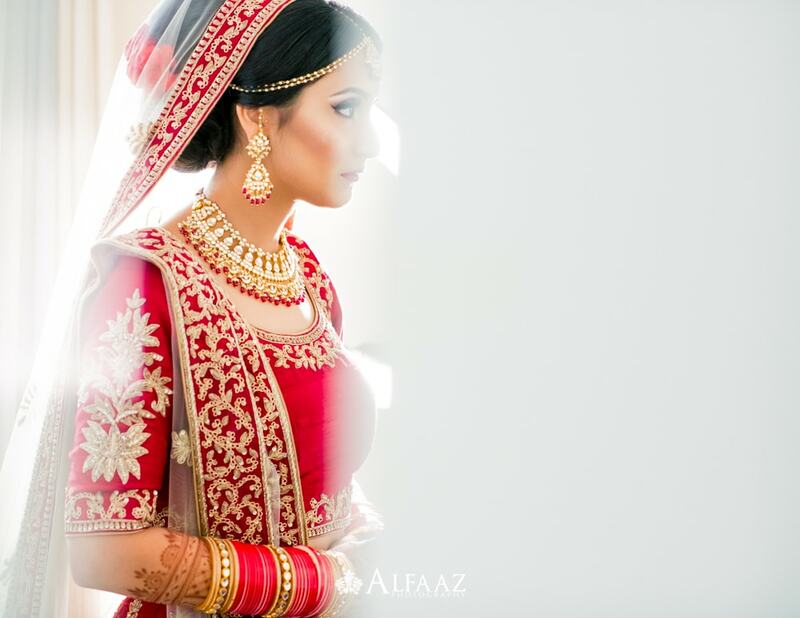 The Bride is usually at the ceremony location 15 to 20 mins before the arrival of the Baraat so no one can see her before the Baraat comes. 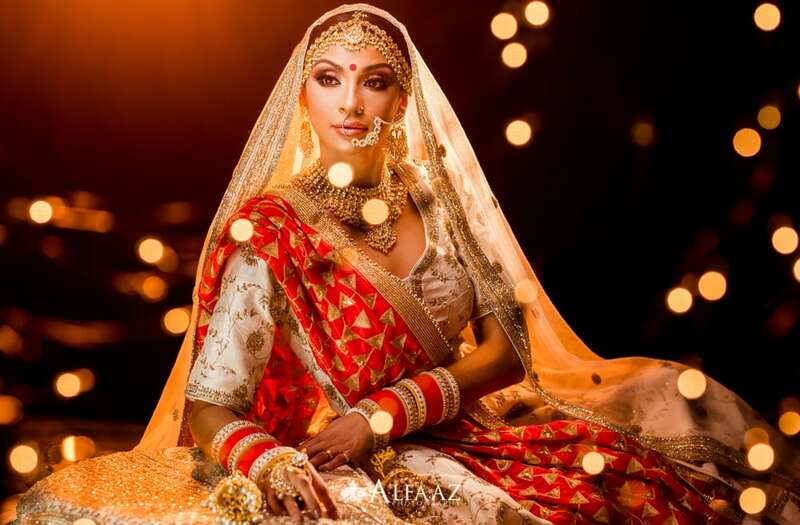 Milni is an Indian wedding tradition where the Bride’s family is introduced to their counterparts from the Groom’s family. This process on average takes about 15 mins which may vary depending on the number of family members introduced. 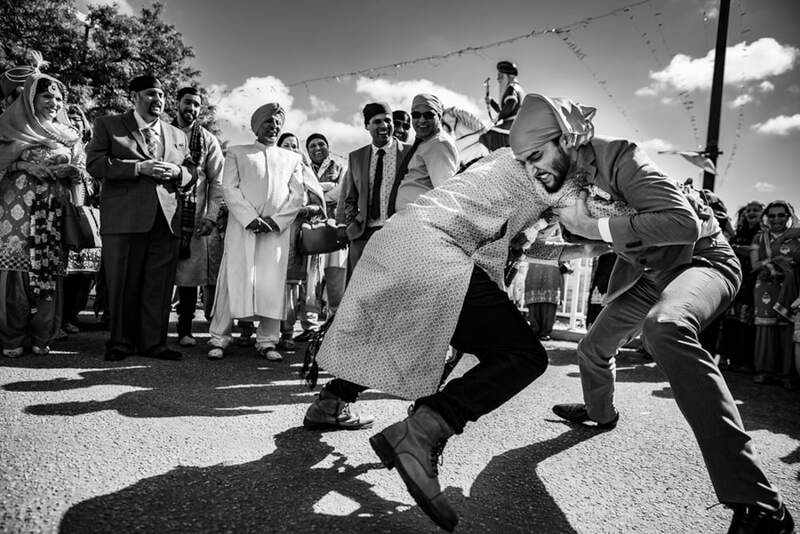 In Sikh weddings, there will be prayer, known as Ardas, before the Milni begins. 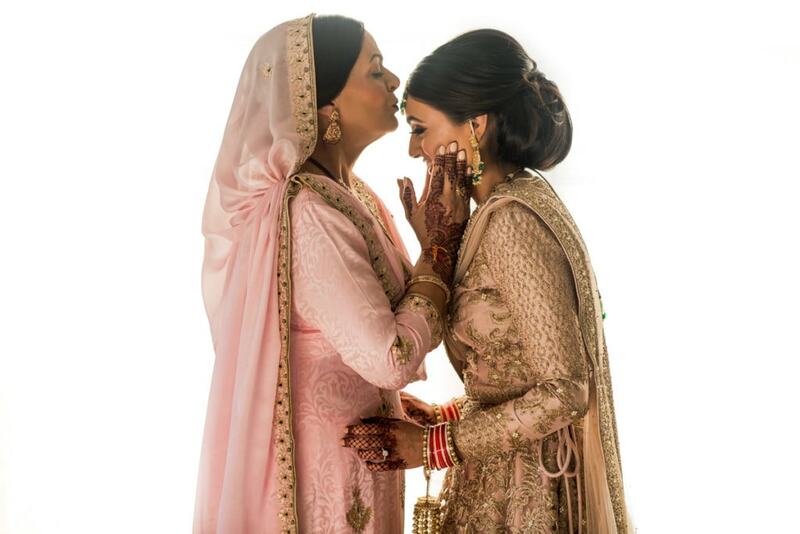 In Hindu weddings, Aarti is usually done by the mother of the bride. In this wedding tradition, the bride’s mom or aunt will welcome the groom and lead him into the ceremony which takes about 10 mins. 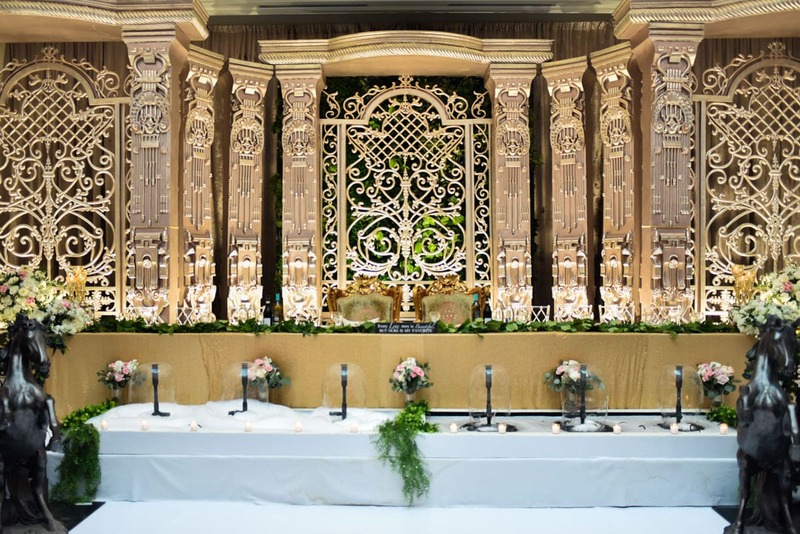 Ribbon Cutting – In Hindu and Sikh weddings, there may be a ribbon cutting ceremony after the Aarti or Milni. In this ceremony, the bridesmaids and the family of the Bride will stop the Groom and his family from entering the ceremony location and the Groom has to pay the bridesmaids before entering the ceremony. 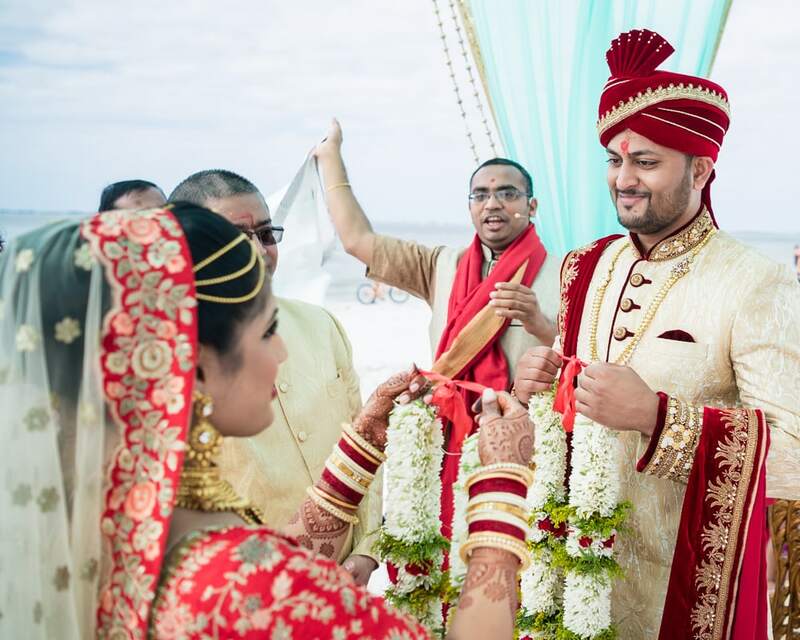 The Ribbon Cutting Ceremony may take 10-15 mins if it is done in the morning, although this ceremony may also be performed at the Bride’s house after the ceremony in some cases before the Doli or Vidaai, the Bride’s send off. In the morning before the ceremony, there is a breakfast meal served at the ceremony location. Bank about 30 mins for this part of the day. The Sikh wedding ceremony starts with Kirtan, religious music, for about 15 mins before the actual ceremony starts. During this time, the Groom will enter the hall where the ceremony is taking place. 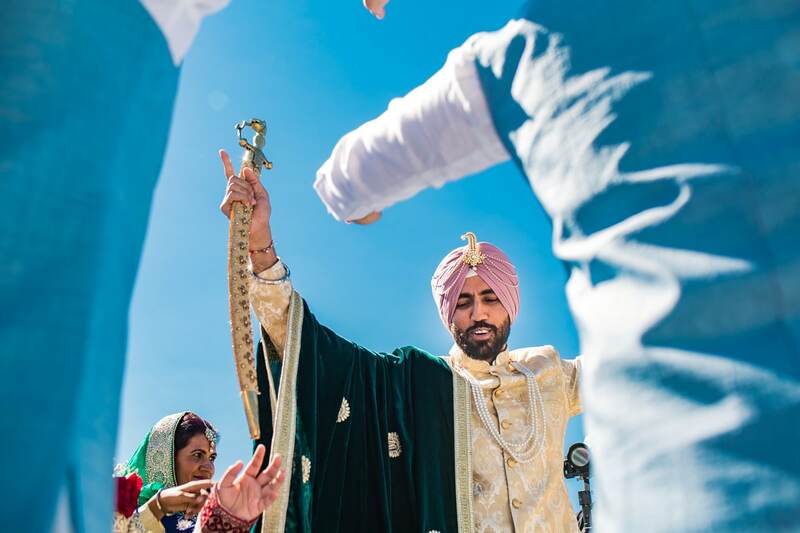 The Groom will be invited by the priest to sit in front of the Sri Guru Granth Sahib, the Sikh holy book, and then the Bride will be invited to make her grand entry after one religious prayer. 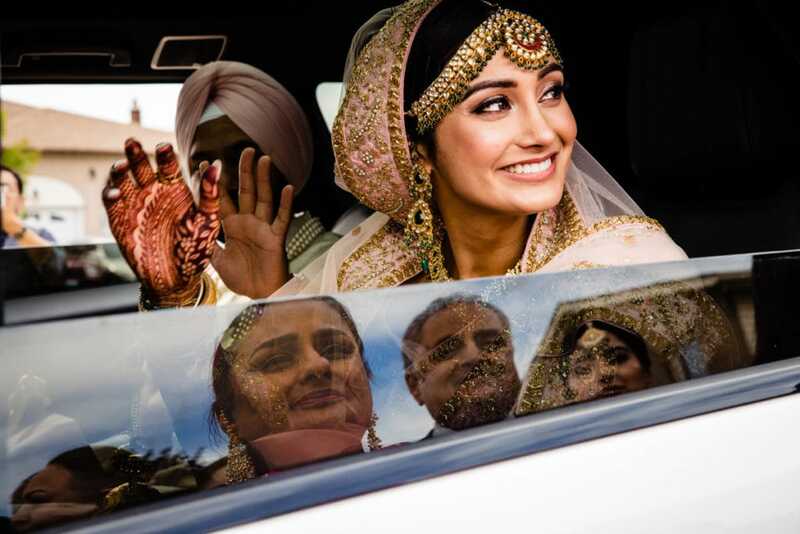 The Bride walks in the ceremony usually with her parents at a Sikh wedding. 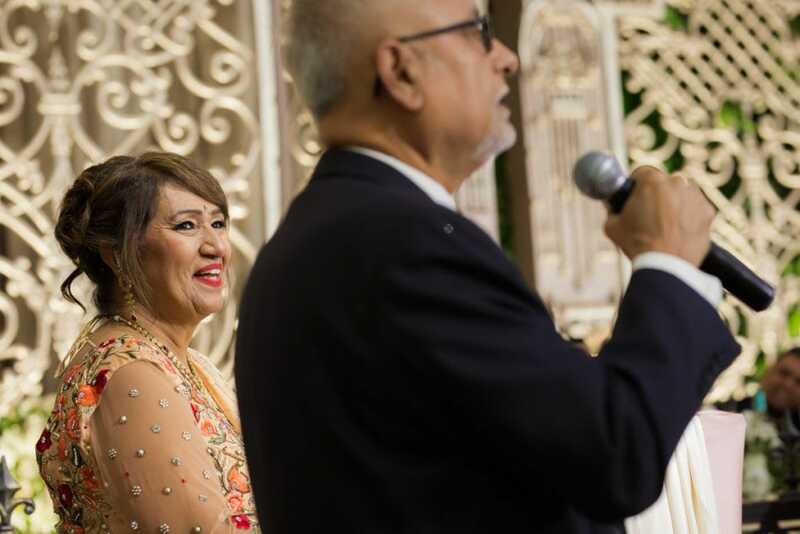 Then the ceremony begins with an Ardas during which only the Bride, the Groom, and their respective parents will be standing. Following which the Bride’s father will be invited to come to the front and hand over the Groom’s palla, scarf, to his daughter for the ceremony. 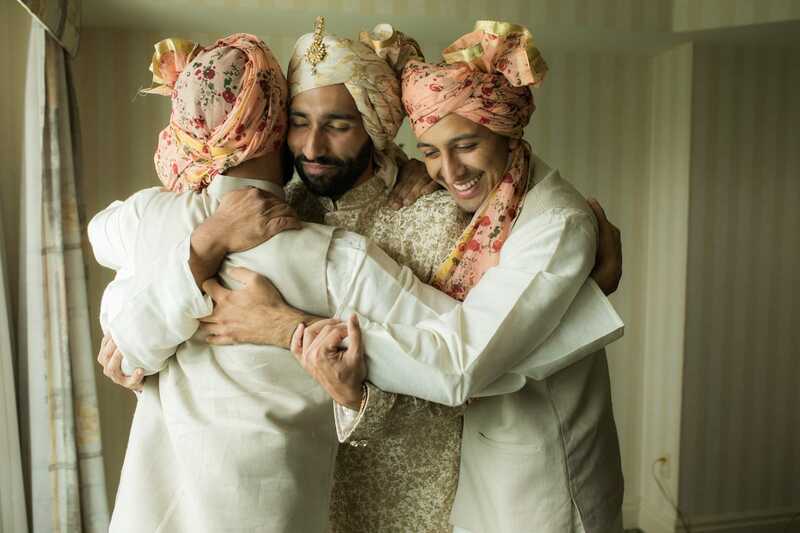 Now, the Groom and Bride will be going around the holy book 4 times as the priests chant religious prayers before they are declared husband and wife as per Sikh wedding rituals. The religious part of the ceremony takes about 45 mins and must be completed before noon. After that, all the guests will come and give a blessing to the couple and take a photo which will take about 30-45 mins for a wedding party of 350-400 guests. Hindu ceremonies start with the Groom getting to the Mandap, the altar for Hindu wedding ceremonies, there is a prayer performed to welcome the Groom to the ceremony which takes about 10-15 mins before the Bride is invited to go to the Mandap. 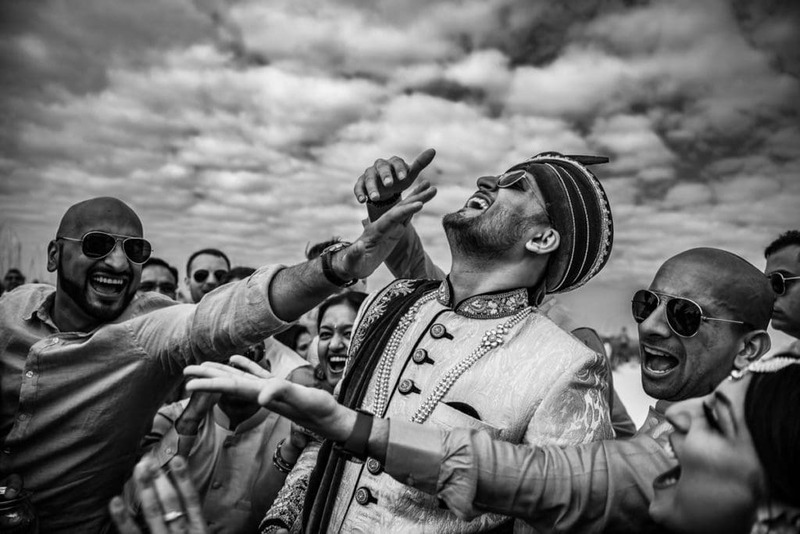 In certain cultures, like Bengali weddings, the Groom is given a new pair of clothing from the Bride’s family which he has to put on for the ceremony, which might take an additional 10 mins. Mangalsutra and Sindoor at the Hindu wedding ceremony are the final steps marking the Hindu wedding and last about 5-10min. Both the Mangalsutra, wedding necklace and Sindoor, red vermillion mark in the Bride’s hair parting, symbolizes that the woman is married. Hindu wedding ceremony lasts about 1 hour for the religious part and if the priest is very detailed and translates a lot of the scripts to English, it may take 1 hour and 15 mins.After the ceremony, only family members or sometimes the guests will take photographs with the newlyweds which may take another 30 mins for about 120-150 people. Sikh and Hindu religious ceremonies take about 1 hour. 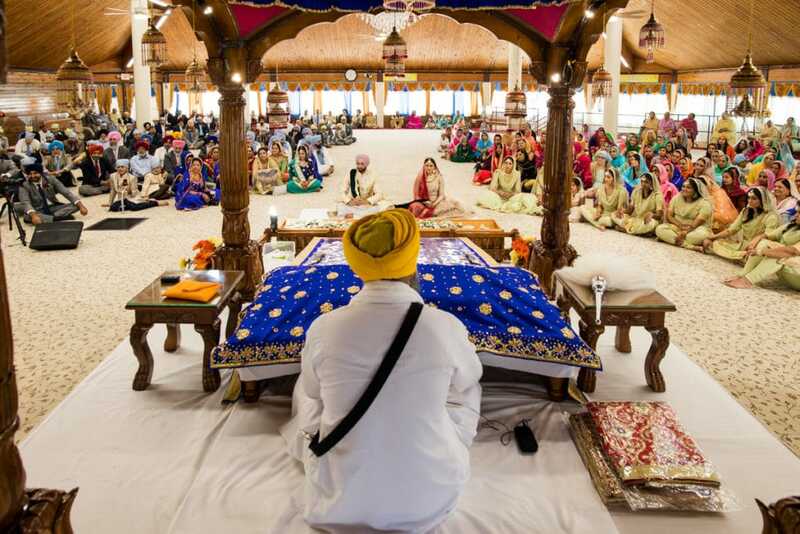 Sikh ceremonies usually will take less time than Hindu religious weddings. 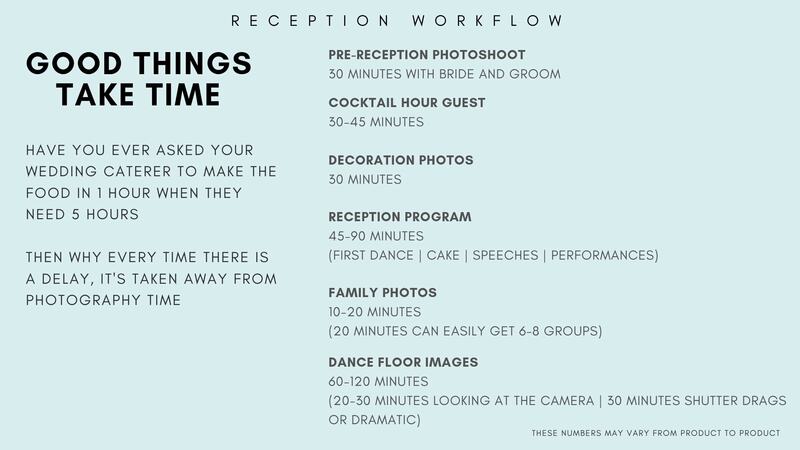 Depending on the number of guests taking photos with the Bride and Groom may take 30 to 60 minutes. 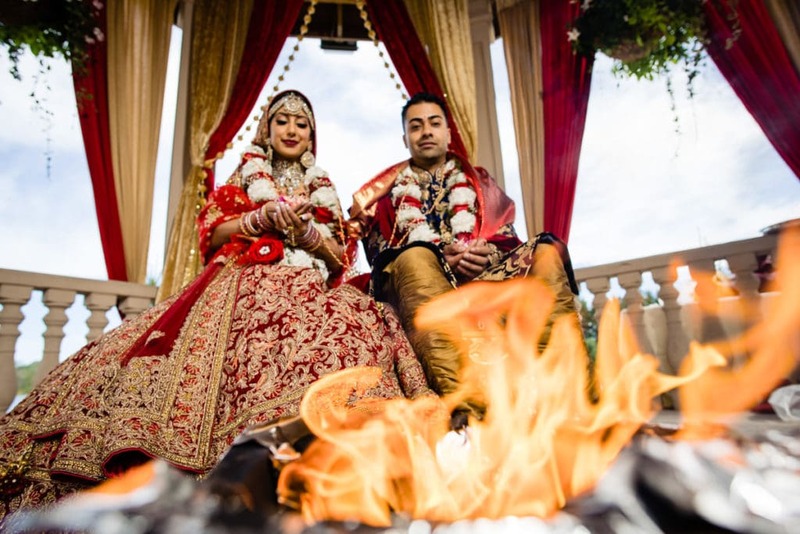 For Hindu weddings, as photographers, we prefer the Bride and Groom giving us a list of people they will like us to photograph after the ceremony in a formal photo session. Sikh weddings everyone comes forward and gives blessings while we photograph them. After the ceremony, all guests are invited for a lunch/dinner and it may take about 20-30 mins after the family photos before the couple gets to leave the ceremony. These parts depend on the distances between locations and preferences. 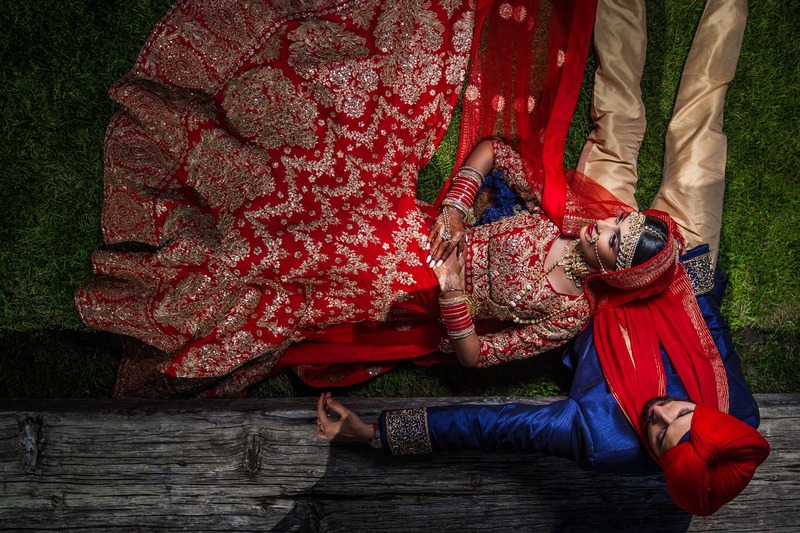 Photoshoot – Usually the couple will go for photos after the ceremony with the photographer which takes about 45 to 60 mins of photography time and about 15-20 mins of travelling time. 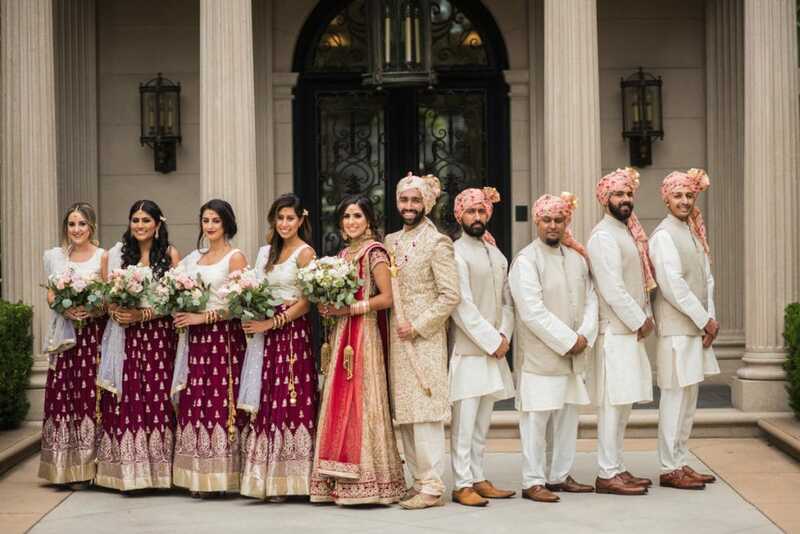 Wedding party photos – If the couple would like to invite their bridesmaids and groomsmen to the photoshoot location for group shots, we would add another 1 hour 30 mins to the timeline. Usually, we will photograph the couple and the wedding party for the first 30 mins and then let them go since we want the couple to feel comfortable and not get distracted. We require 45 mins with the couple alone after the bridal party photos are done. To summarize set aside about 90 mins plus about 20 mins commute for a Sikh or Hindu wedding post-ceremony photo shoot. 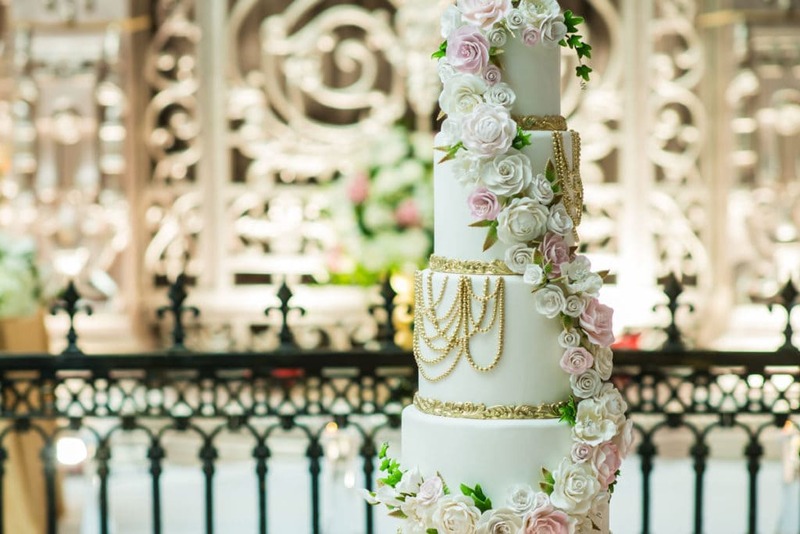 Depending on whether the bridesmaids did or didn’t do the ribbon cutting ceremony, this tradition can take place at this point in time and last about 15-20 mins. 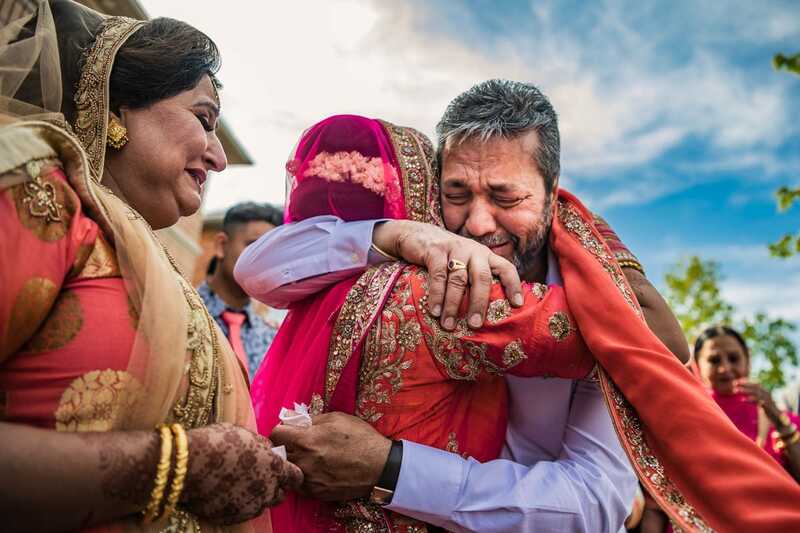 Some people prefer doing the Bride’s send-off from the location of the ceremony and others prefer having the Bride depart from her parents’ house. The latter inevitably takes more time.Once the Groom makes his entrance at the Bride’s house, everyone is served tea and snacks before the Bride’s Send-off ceremony starts where the bride is given blessings. 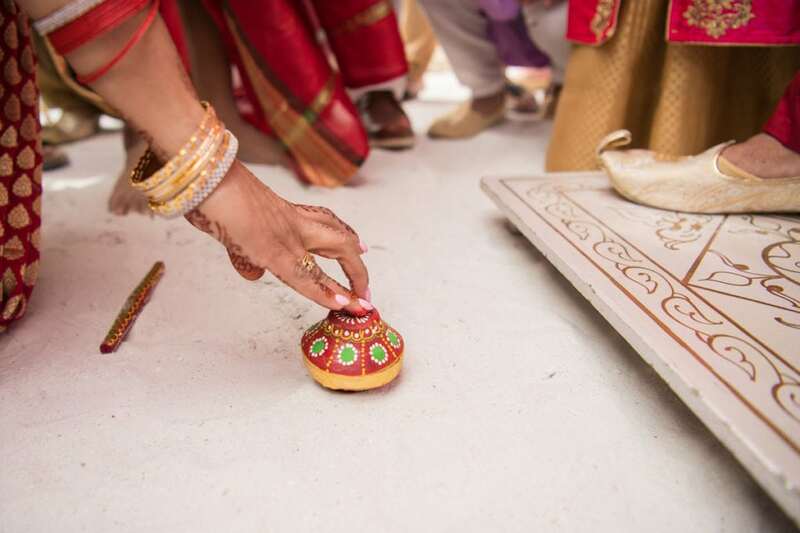 The Bride throws rice 5 times around her house as a symbol of prosperity. The Bride greets her family before leaving with Groom in their car. 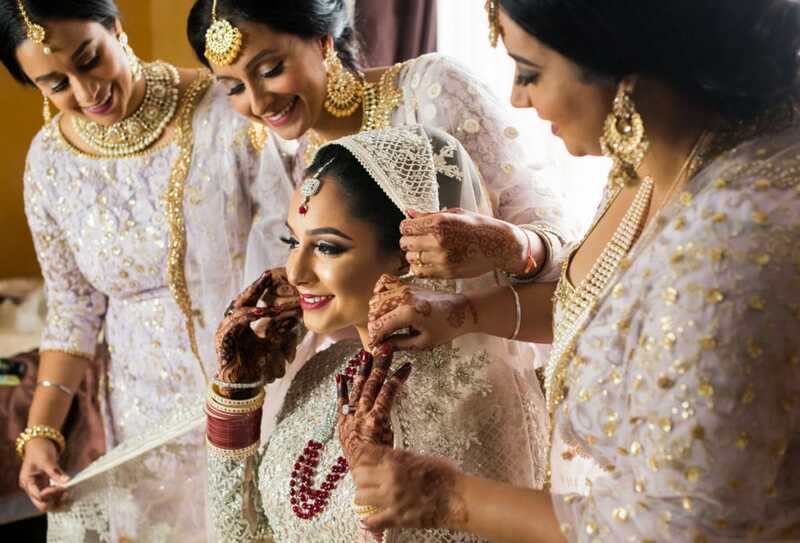 In certain cultures like in the Gujarati culture, every single member of the Bride’s family will line up and the Bride will be greeted every member which takes additional time. The Bride then sits in her car and her brothers will push the car as the driver starts to drive-off in the final moments of the send-off. The whole Vidaai process may take between 60 to 90 mins. Although this is where the timeline may completely go off-schedule. Service tea and Snacks sometimes take longer than expected. 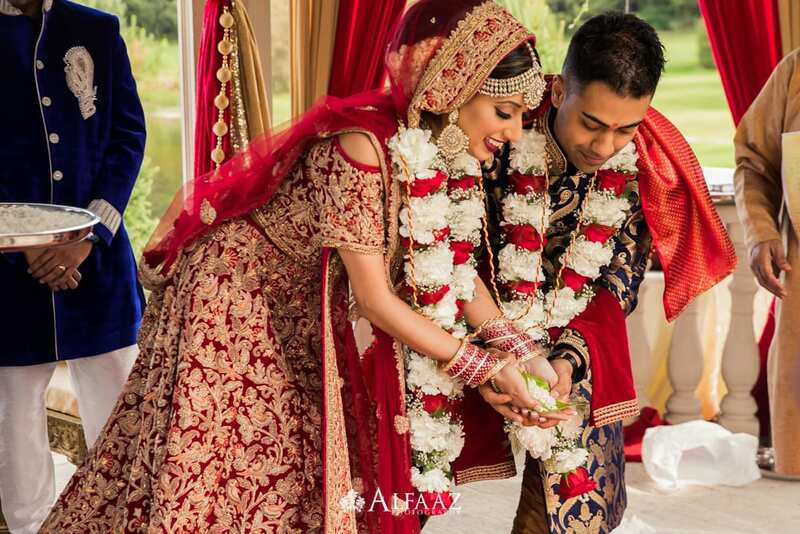 Tip to save time – We suggest that the Groom’s family reaches the Bride’s parents’ house right after the ceremony so all the tea and snacks part is completed while the couple is doing their post-ceremony photo shoot. Bank about 1 hour for couple shoot with 15-20 mins commute to the photoshoot location. 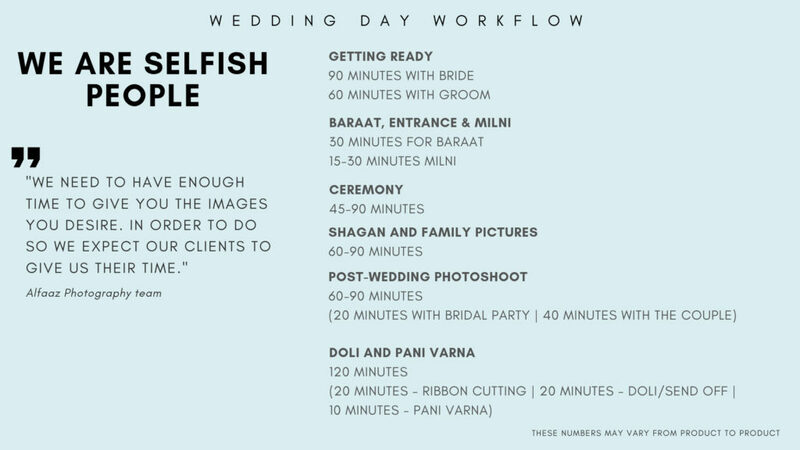 If the wedding party (bridesmaids and groomsmen) are coming as well, then post wedding shoot is about 1 hour and a half (45mins with the bridal party and 45 mins with the couple). 3. 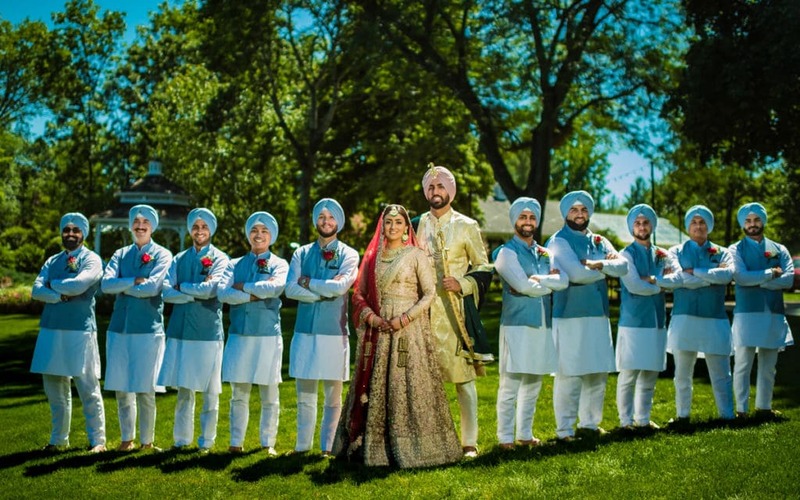 We always suggest to have separate transportation for the couple so after the bridal party is done with their pictures, they can leave which eases the couple. 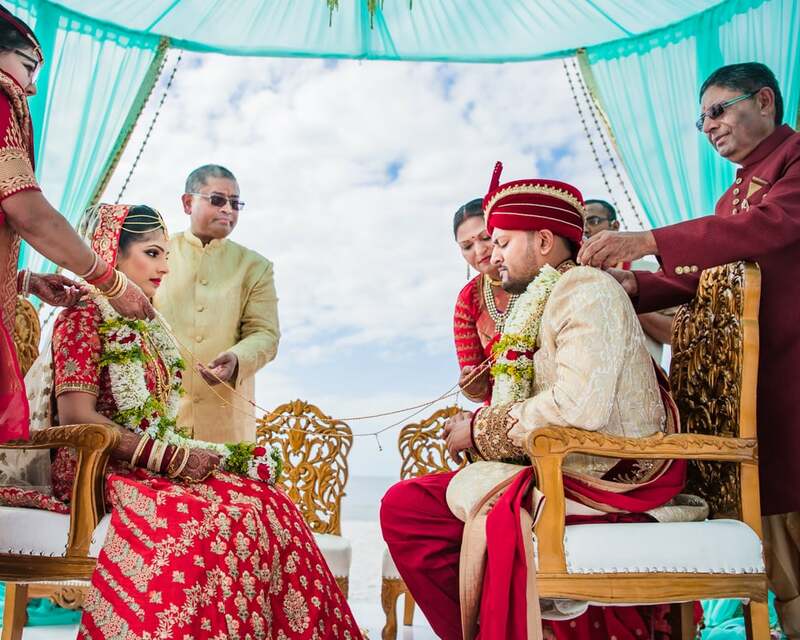 Doli from the ceremonial venue can save you about 1 and half hour from your wedding day. Add about 1 hour and a half to 2 hours for ribbon cutting and Bride’s send-off. Consider having the Groom’s family go to Bride’s parents’ house right after the ceremony to save time. We usually conclude the service for photography at the Bride’s house. 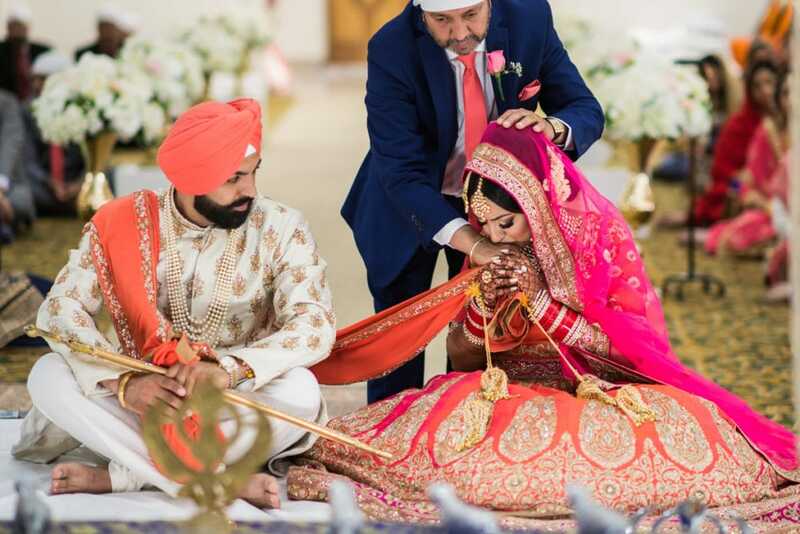 In Sikh weddings, the Groom’s family may request Pani Varna service which is about a 10 mins ceremony done at the Groom’s house when the Bride comes for the first time. 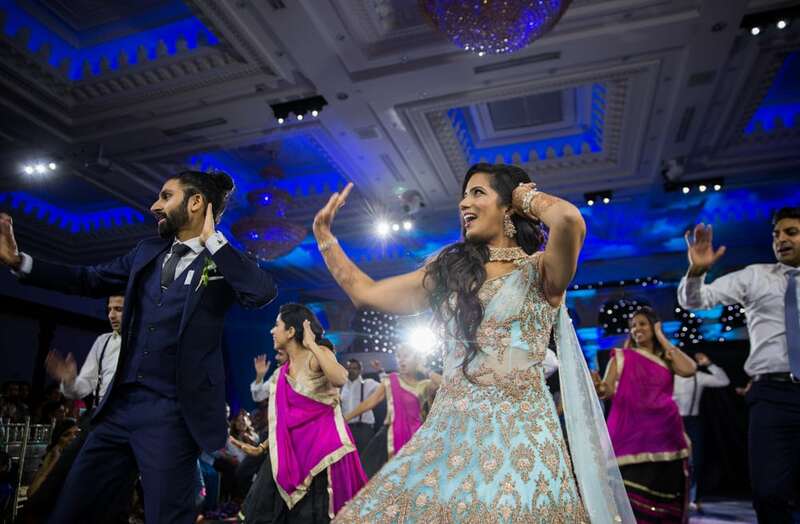 Depending on same day Sikh or Hindu Wedding or two-day wedding the timeline may vary. On the same day wedding, the Bride should be back at her hotel to get ready for the reception by 3:00 pm or 3:30 pm. On a two-day wedding, the Bride will start to get ready around 2:00 pm hence ready by 5:00 pm. In either case, we start our photography service around 5:15 pm wherever the couple is getting ready or at the location where the couple is taking pictures. Reception Photoshoot is about 45-60 mins from a photography standpoint including commute. Depending on the number of guests you have if you wish to enter the wedding reception by 7:45 pm or 8:00 pm. Please give about 2 hours for your guest to mingle, enjoy cocktails and appetites and settle in the seats so you can enter.Allow about 2 hours for all your guest to arrive, mingle, enjoy cocktails and appetizers. 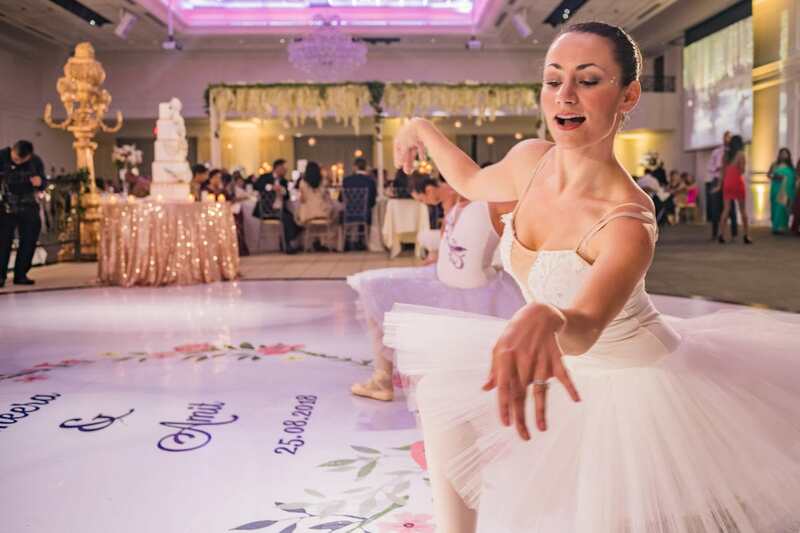 This will also give the opportunity for all your guest to settle in their seats and set your entrance time around 7:45 pm or 8:00 pm at your wedding reception. This is where the bridal party is very important; they should help guests settle in their place so the couple can enter the reception on time. Usually, the reception cocktails take place in the foyer area outside the reception hall. Getting guests inside the hall once the doors for the reception hall is open can be a challenge sometimes. One tip we give our couples is to close the bar outside the hall and open the bar inside so traffic moves inside the hall. Couples are usually done with their photoshoot around 6:15 pm after that either the couple stays at the bridal suite at the reception location or at their hotel until everyone settles down in their reception seats. The second option is to mingle with their guests during the cocktail hour which is another way to utilize that time between 6:15 pm to 7:30 pm. Not only this saves you time on your reception. From our experience, we feel couples enjoy their reception a lot more if they have a chance to mingle with their guests before their entrance. 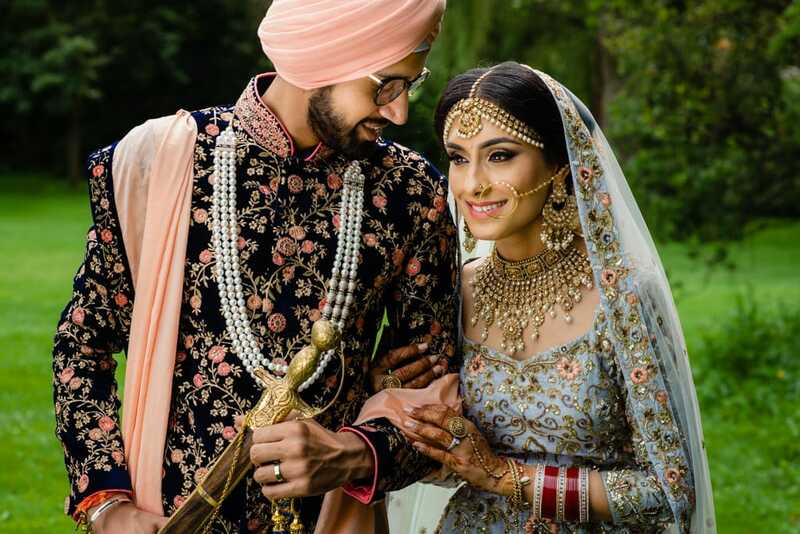 The couple usually walks in the reception between 7:45 pm to 8:15 pm and usually followed by the first dance, speeches, cake cutting or performances which may take about 45 mins to an hour depending upon the number of events. 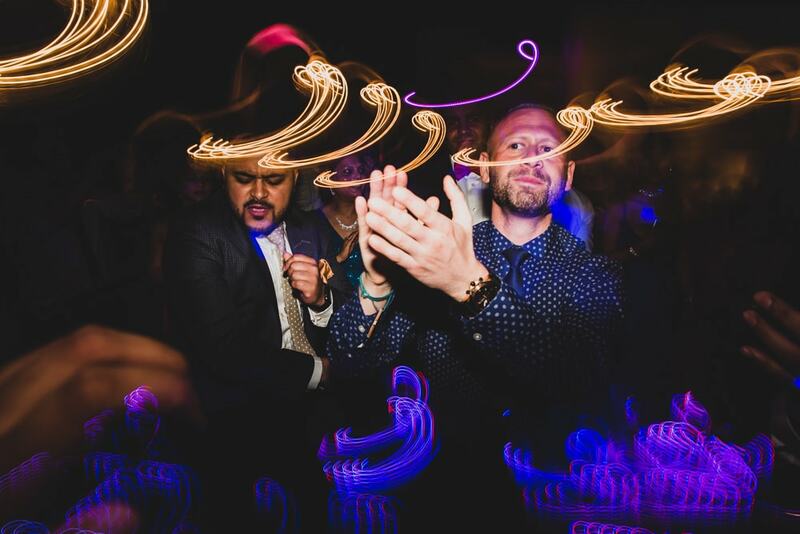 After the reception program is done between 9:00 pm to 9:15 pm, we suggest opening the dance floor right after the first dance and the couples’ dance because everyone is on the dance floor anyways. This is a perfect time while everyone is busy on the dance floor to take some close family photos which take about 10 mins. We invite the couple and their parents to take family photos on the stage quickly before the Bride’s makeup starts to wear off. We request couples to give us a list of people they would like us to photograph during the reception family photos prior to the wedding. If there are more people who would like to take pictures with the couple, we ask the couple if they want to take more formal photos, otherwise, we can always sneak them out for pictures to avoid long lineups for formal photos. 9:30 pm – Dinner is served and this is usually a perfect time for us to grab the couple’s rings for a ring shot. 9:50 pm – We ask the couple if they would like to sneak out for some night photos in the parking lot. These images take about 10 mins and give another dimension to your final photography product. 10:30 pm – We usually ask the Bride’s mom to invite all the Bride’s family for a big family picture and the same for the Groom’s side as well. 11:00 pm – We take a lot of photos on the people dancing. 11:30pm – We usually take our last shot from the DJ’s booth as the DJ calls everyone on the dance floor so we can capture a big group shot.